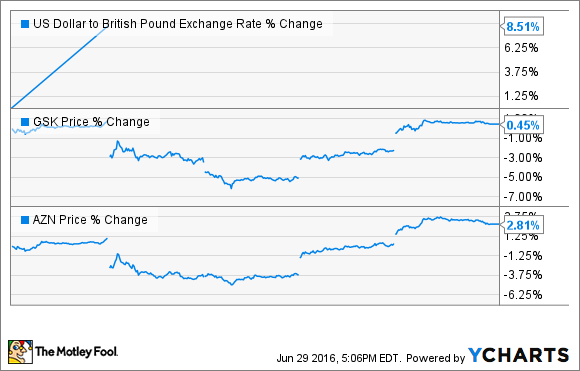 With the British pound in freefall, here's what U.S. investors holding ADRs need to know. Following last week's Brexit vote, the British pound suffered one of its biggest single-day drops in history and was at a 30-year low against the dollar at the time of writing. With some economists suggesting that the pound could fall to parity with the dollar, U.S. investors holding American depository receipts (ADRs) for British companies are right to wonder how post-Brexit currency fluctuations might affect their returns, and dividends, going forward. ADRs are certificates issued by banks that represent shares in foreign stocks. This makes it easy for Americans to invest in foreign companies. At the same time, however, because ADRs are denominated in dollars while the underlying stock is denominated in a foreign currency, they expose the owners of the certificates to exchange-rate risk. If the foreign currency falls in value relative to the dollar, so too will the ADR. This doesn't bode well for owners of ADRs right now, given the strength of the dollar. To this end, Wall Street treated British drugmakers GlaxoSmithKline (NYSE:GSK) and AstraZeneca (NYSE:AZN) similarly on post-Brexit Friday, with losses of 4% and 5%, respectively. Let's take a look at differences between the companies, and try to gauge how currency fluctuations might impact their ADRs in the quarters ahead. GlaxoSmithKline records its results in pounds. During the three months ended in March, Glaxo recorded $1.96 billion in U.S. pharmaceutical sales, which it reported as 1.37 billion pounds to British shareholders. Suppose sterling remains at Monday's exchange rate of $1.32 to the pound. If Glaxo's U.S. pharmaceutical sales were otherwise flat in the second quarter compared to the first quarter, the company will nevertheless report a sequential increase in its pound-denominated revenue -- this assumes that the proceeds from the sales weren't converted from dollars to pounds before the latter's fall. U.S. investors holding Glaxo ADRs have less to look forward to. If first-quarter profits remain flat in the second quarter at 0.058 pounds per share, ADR holders will see their slice fall 7.2% from $0.083 per share to $0.077 per share, or $0.154 per ADR. They would also see the annual dividend of 0.80 pounds paid last year, which management expects to freeze at that level through 2017, fall as well. This means 100 Glaxo ADRs that paid $234.81 last year, after the $0.02 per ADR dividend fee and excluding the special dividend, would fall to just $209.20 if the exchange rate remains at its present level. Beyond the dividend however, there are benefits that come with a depressed currency. For example, Glaxo's low-margin consumer healthcare products manufactured in the U.K. will become less expensive in foreign markets, and possibly lead to increased sales. Unlike Glaxo, AstraZeneca records its sales in U.S. dollars. Although the greenback's steady rise over the past couple of years has been a thorn in Astra's side, it's working out in the company's favor at present. During the first quarter, Astra recorded $6.11 billion in total revenue. That was a 1% increase in sales over the same period in the previous year but would have resulted in a 5% gain at constant exchange rates. On the bottom line, the company reported earnings of $0.51 per share, or a rise of 17% over Q1 2015, that would have been 26% excluding the negative effects of the dollar rising against other currencies. Before you get too excited, reported earnings are much higher than core earnings because of recent recognition of over $1 billion of external revenue from entering collaborations with Celgene and other companies. Astra is guiding revenue and core earnings to decline at low to mid-single digits this year because of restructuring costs and loss of exclusivity in May for Crestor, a drug responsible for $1.16 billion of first-quarter sales, or about 19% of revenue for the period. While the euro's slight drop against the dollar won't help Astra's bottom line, the depreciating pound might cause the company to revise its core earnings guidance upwards. A great deal of the company's operating costs originate in the U.K., which means a falling pound should lower expenses, and increase profits. Astra included a sensitivity analysis related to major currencies in its first-quarter report that predicted a 5% drop in the pound against the dollar, based on exchange rates since the end of March, would result in a $96 million increase in core operating profit. As of today, the pound has fallen 8.8% against the dollar since the end of March. With core operating profit in the first quarter of $1.59 billion, lowered operating expense because of a falling pound won't completely remedy impending losses, but it could help. As for the distribution, Astra hasn't announced its twice-annual dividend yet, but ADR shareholders will probably fare better than they would have if more members of the "Remain" camp had turned out to vote. If you're holding Glaxo, Astra, or another British company's ADRs, now's a good time to look at what currency they report in. As you can see from these two, it's about to make a significant difference, at least in the near term. Something that Wall Street took a few days to work out. Astra's ADRs have risen above their pre-Brexit price as of Wednesday's close, while Glaxo's have remained somewhat flat. Looking further ahead, however there are so many pluses and minuses associated with currency fluctuations that it's nearly impossible to forecast how they'll all wash out in the end. Before changing positions in these ADRs consider their products and pipelines, before their currencies.